I am trying out some new things to vamp up the billboard bags. 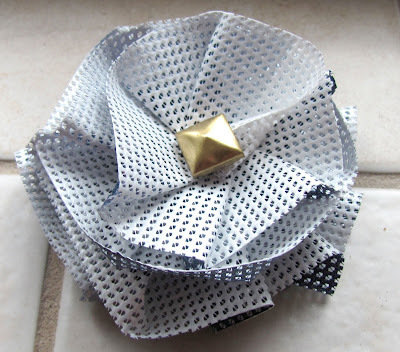 Last night I made this mesh flower that i can sew on to any of the bags. The mesh also lends itself to embroidery because its a grid like aida. So I am going to experiment more with sewing on the bags and making accessories for them. I took apart a studded belt and the inside of the flower is the stud from it. Wow I wouldn't have thought it could look that good! Impressive!